Instrumental music can get lost in itself, trying to overcompensate for lyrics, with technicality. This band is not that, the 3 piece consisting of Jon Stickley on guitar, Lyndsay Pruett on violin, and Patrick Armitage on drums, is a grooving force of nature. While all three are complete and professional musicians, they keep their music very fun and accessible. A lot of acoustic music is very similar and you almost have to have an interest in it to stop and listen to it. The Jon Stickley Trio reminds us that Bluegrass can be fun and expansive at the same time and that we don’t have to sacrifice musicianship for dance-ability. This is a touring band and it comes through with how locked into each other’s playing they are. The guitar player and namesake of the band is one of the best flat pickers I’ve ever seen/heard; He reminds me of Tony Rice, just with more notes. He has absolutely effortless technique and is quite the showman. Armitage probably has the coolest job description in the world as a progressive Bluegrass drummer. You don’t hear too much actual percussion in this type of music, but they have a full on Rock-and-Roll drummer. He can play a Salsa beat just as good as he can play a John Bonham type Rock slinging solo. Last but not least is Pruett, who is an absolute show stopper. I’ve never been a big violin fan, but this girl has complete control over her instrument. She is a fire breathing dragon when it’s her turn to show her chops. The EP starts with the song "Blackburn Rovers," an upbeat guitar song with a nice Latin backbeat. 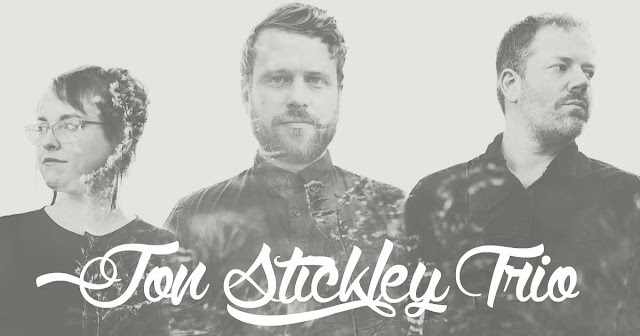 This really showcases Stickley's guitar playing and has some awesome guitar drum interplay. Next up is "Plain Sight," which was written after the shootings at The Bataclan in Paris. There is a definite somber tone to the song, with beautiful rhythm guitar playing under soaring violin work from Pruett and Armitage really cooking it up underneath all those textures. There is some great call and response guitar/fiddle work towards the end of this one, with lots of emotion captured. "Palm Tree" starts on a more upbeat, happy note especially in comparison to the darker tone of "Plain Sight." This is truly Pruett's time to shine and show her musical prowess. All three get together to really progress this song forward, together with Stickley taking the guitar for a walk towards the end. "Echolocation" is the penultimate track and really takes the progressive feel to another level. It’s an almost conceptual song, written for whales and other underwater creatures, and if you go into the song knowing that it really enhances it. It features some awesome Western/cowboy guitar in the middle section and some massive arpeggios from the violin and guitar during a rock throwing drum solo rounding it all out. This song really shows off the bands musicianship, unique sound and range. The final number on the Triangular EP is a tribute to past musicians that paved the way for bands like JST. "Manzanita" is a song originally written by what I would assume was Stickley's hero, Tony Rice. Stickley really turns on the flat picking here and the drums are a welcome sound in this New-Grass classic. I can’t help but think Tony would love this version of his song, in all its progressive-ness. Overall, this is an exciting new EP from an exciting young band. I don’t really know what to call it, but I’m going to go with "Prog-grass" until I can think of something better. It’s exciting to have NEW and good instrumental music and I’m really looking forward to watching all of these musicians grow together and in the scene.